October 19, 2017–Dairy is the most critical livestock sub-sector in Sri Lanka. This is due to growing demand for fresh milk and milk products and the sector’s potential to grow the rural economy. Today, just over 30 percent of fresh milk demand is met locally. The Sri Lankan government has set an ambitious target of reaching self-sufficiency by 2020. The five-year, $14.1 million Market-Oriented Dairy Project supports farmers and enterprises to meet the demands of Sri Lanka’s dairy sector and catalyze sustainable growth. 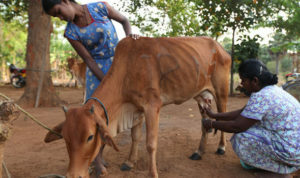 The project will increase agricultural productivity and expand the trade of milk and dairy in Sri Lanka—and do so in a way that benefits all stakeholders along the dairy value chain, as well as consumers. In partnership with the private and public sector, IESC anticipates increasing milk production of participating farmers and farms to 83,400 metric tons by 2022—an average annual growth of 18 percent and a total increase of 127 percent. In addition, the project will reduce quality-based rejections at collection points by 80 percent among partner dairy companies and farmers. Specifically, this project will ensure that farmers have better access to quality cattle, artificial insemination, and other veterinary services. It will also increase the farmers’ knowledge of and ability to meet quality standards and best practices for good hygiene at all levels of dairy farming and collection. Finally, the project will develop a mobile app to connect buyers and providers of important dairy supplies and services, creating an online marketplace like a Craigslist for cows. IESC will provide highly experienced industry and technical experts to deliver targeted assistance to dairy entrepreneurs. For 53 years, IESC has set the standard for fielding expertise, including volunteers, to support enterprise growth in developing countries and emerging markets. Market-Oriented Dairy is funded through the USDA Food for Progress Program. 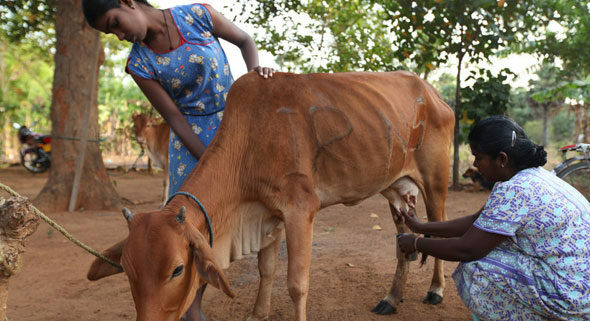 IESC implements the project in partnership with the University of Florida, the Global Dairy Platform, and Sarvodaya.